I know, it’s been awhile. Last month I used up all of my words writing this article for the Real Estate Magazine, which defies its name to feature local human interest stories. I was excited to be invited to write the cover story for last month’s issue and it’s created a real buzz around town. I can’t go anywhere now without someone mentioning the article; even my physical therapist brought it up while doing an ultrasound on my right hip last week! Publishing this article made me realize two things: 1) The interweb is miraculous, but it’s really nice to be able to put something in someone else’s hand. Print media is so not dead. 2) We need to write, write, write. I have mega guilt about not making enough time to tell you all about our project because we are too busy doing it. And that is totally counterproductive. The whole point of this eat local experiment is to share the journey along the way. I was recently in a gamechanging car accident and it has made me realize one thing quite clearly: it’s time to slow down. No more living the “slow food” life in the fast lane. We need to make time to live and eat local, and also time to tell you all about it. So, that is my promise. More soon. For now, if you haven’t read the article, yet, you can download it in PDF form or read the text below. Eat well and drive safe. A few weeks into this year, I found myself in the First Aid aisle at CVS, completely dumbfounded by the Band-Aid selection. A kitchen accident had resulted in a gnarly flesh wound to the thumb and I needed a protective layer between my hand and the world. I thought there were two kinds of Band-Aids: the soft fabric ones and the plastic ones. I like the soft ones. Simple, right? Not simple. Niche marketing has hit the Band-Aid shelf; the selection stunned me. They now come in every texture and shape, and in variety packs that make you question whether any one Band-Aid could possibly meet every human need. I spent over fifteen minutes studying the wide assortment of bandages that I might need for a host of unforeseeable injuries at some point in the unknowable future. Feeling defeated, I finally settled on a variety pack, sans pre-applied antibiotic cream. This little errand exposed deep realizations about my changing relationship with “stuff.” It was less than a month into our food project, but radically modifying my decision-making process around food had recalibrated my entire life – and it couldn’t be more unlike the Band-Aid aisle. On January 1st, 2013 my friend Gowan and I embarked on a year of eating food that is grown, raised and foraged in Mendocino County. We made a choice to know where our food came from – all of it. We chose to commit to this place we live and love. We chose to feed directly from the land and sea and live by the seasons. Ultimately, we chose to make life more complicated for the sake of simplicity and signed up for a year of uncompromising limitations to open the door to abundance. We chose to do all of these things out of graceful optimism and bull-headed stubbornness. Fundamentally, we knew we could do it. Gowan is a farmer and a maker of all sorts of things, from gorgeous compost to fine silver jewelry. I am a lover of food, professional dot-connector and a media machine. Together, we are some kind of home-grown DIY girl farmette with hundreds of online fans. Our goal is simple: to live off the land and the sea, and love it. It is also our goal to inspire a new agricultural future, celebrate abundance and build as much topsoil as possible. In the weeks leading up to the New Year, I cleared out my pantry, fridge and freezer, purging anything and everything that wasn’t grown, raised, or foraged in Mendocino. This meant that there was almost nothing left. I had not been freezing, drying, canning or preserving anything in preparation for this mammoth undertaking. I only decided to join Gowan in this adventure a week before Christmas! I gave away five bags worth of groceries, all of my spices, and my entire beloved tea collection as Christmas gifts. We are not making exceptions for staples such as grains or oils. Some of those things grow here, and those that don’t will not be staples for us. We will not use spices, sauces or flavorings that made with ingredients produced outside of the County. This is where it gets real. If we are traveling or happen to be outside of the county, we will be 100% committed to eating food that is locally produced in that place, as close to the farm or garden as possible. Our first priority is to produce as much food for ourselves as we can and source the rest directly from the farmer, rancher, fisherman through barter and exchange. We will also support local grocers that sell locally produced food. Food is our clock, time revolves around its procurement, processing and preparation. This involves frontier land resourcefulness and a lot of dishwashing. A couple weeks ago I saw a bumper sticker that said, “I don’t buy food from strangers.” That’s probably the simplest way to describe the parameters of our project. Our survival now depends on knowing our community more intimately than ever before. There is a simplicity to our meals because we start with what is available and work from there. Each plate is also a complex web of relationships between people and the land. We can trace these connections item by item, meal by meal. I realized one day in January that I knew every single thing that I was putting in my body. I knew we were going to get really cozy with our food, but this is an impressive reality to live. There are no hidden sources, no unknown preservatives, nor any un-pronounceable ingredients. Nothing but real, whole foods with a story. There are many people to thank for our survival. We would not be alive without the one hundred and fifty pounds of potatoes we got from John Richardson at Noyo Hill Farm. John and Charline Ford’s grass-fed beef has been keeping meat on our bones. Gowan’s Oak Tree farmstand in Philo is making life much sweeter, with their well-stored apples and dried pears, peaches and persimmons. We also love the local stores that make a point of stocking local products, which are surprisingly hard to come by. For this reason, Scott Cratty is our hero. He is the owner of Ukiah’s most revolutionary corner store. He has filled the shelves with 100% local produce, and introduced us to many local treasures such as Pennyroyal Farm cheese, McFadden Farms dried herbs/spices and pistachios from Calpella! In Scott’s words, “Mendocino County is the place where your next door neighbor is doing the coolest thing that you will never know about.” Word. Never has it been more important for us to know our neighbors. Through the process of sourcing food, strangers have become friends, and we are awed and humbled by the kindness of our community. People have shared with us so many items out of their own freezers and pantries, including goat and pork meat, dried peppers, seaweed, salt, corn, flax seed, quinoa and wheat. It truly does take a village to feed a locavore; we are always accepting donations, so let us know if you would like to feed us or show us your favorite fishing spot! To juxtapose this with the current food system is a stark, astonishing contrast. We live in a world where food is largely divorced from source. Even for people like me who generally eat healthy and shop at the Farmers’ Market, taking it to this level is completely gamechanging. Much of what we eat has changed hands many times, is highly processed and packaged, and the production and distribution of these green-er foods is fueled by petroleum. While it may come in a recycled paper box, printed in soy ink and bears an organic and Fair Trade label, much of your food probably comes from really far away. This is inherently unsustainable, and will only prove to be more so as the cost of oil increases. 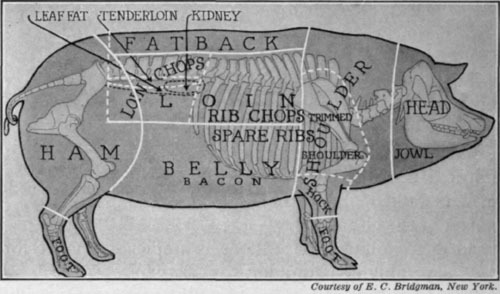 As we have un-globalized our own diets, it has been fascinating to strip away the many layers of the current industrial food system and start exploring what it would take to go back to the old ways, in a new way. Even in the darkest of the winter months, we have been well fed. We are fortunate to live in a temperate climate, where kale grows wild on the headlands, and mushrooms spring up from the forest floor. We began the year trusting that we would survive, but without knowing exactly how. There have been rough spots – especially in the beginning. I still remember the unparalleled joy of picking up our first load of milk and butter on Day #5. I learned quickly that the local diet is inherently low-carb, and had to start eating unladylike servings of potatoes to keep weight on. My body tells me what it needs. When I need fat, I unabashedly scoop the cream off the top of the milk jar. I drown everything in butter. I drink wine when I could use some extra fruit calories. Sometimes I eat honey right out of the jar with a spoon. We have to listen to our bodies, and constantly balance our physical needs with the seasons. We have also gotten pretty good at asking for help, and been blessed with so many acts of kindness in the form of food and fishing poles. Over the last few months our diet has included a lot of kale, meat, milk, potatoes, apples, butter, eggs and bone broth soup. Sometimes we eat meals fit for queens, and sometimes, it is, well totally gross. But, usually it’s really, really good. Often when I feed my friends, they say it is the best milk, orange, beef, cheese, etcetera that they have ever eaten. The paradox of our lives is that opulence and indulgence springs forth from scarcity and compromise. After days of eggs, potatoes, cabbage and kale, suddenly we are eating lemon meringue pie or enjoying a full Thanksgiving style feast on a Tuesday night in February because a thirty-pound turkey unexpectedly thawed due to a power outage. Other times, we are trying to figure out what to do with twenty five pounds of ripe kiwis. And sometimes I am cracking walnuts open with a hammer and sipping champagne. Jar by jar, the pantry has filled. And emptied. And filled again. Food flows in and out of our lives in a tidal wave of bright colors and textures. We cannot afford to stockpile, and there is a newfound comfort in this rhythm. In three months, we have seen that every empty jar is an opportunity and that using things up is the best way to invite abundance – simply because there is no other option. I have long believed that preparing food provides nourishment beyond taste and calories. Sometimes I will spend an hour cooking a meal and by the time it’s ready, I already feel satiated. This, I believe, can be explained by the Ayurvedic perspective that we must experience our food using all five senses. When we are intimately connected with the entire process of our food chain, the rewards are unsurpassed. Case in point: I would argue that nothing can make goat cheese taste better than snuggling just born baby goats. There is another aspect of the locavore life that has nothing to do with the food itself; it’s about money. Every time we purchase food from local farms, ranches and dairies, we are investing directly in the local economy. We are keeping money circulating here at home, rather than subsidizing international companies to feed us. It’s an efficient closed-loop system: by eating locally we actually build local food security – and the ROI is delicious! It is one of our goals to highlight all of the inspired farmers, young and old throughout this county who are committed to feeding the people, supporting biodiversity and building topsoil. This was once a county that grew enough food to be food secure. It is now a county whose two main crops are not food. Supporting these farms is supporting a new agricultural future, so you can have your local bread and your wine, too. I have never been so involved with my food, nor so governed by the natural cycles of the seasons. The most challenging part of the locavore lifestyle has been finding balance between feeding myself and doing everything else. There is no going “back to the land.” I am living with the land, and also running my own consulting business, organizing community events and trying to rekindle my relationship with my yoga mat. Life cannot stop and the dishes must be done. The truth is that it is extremely challenging and also naturally easy all at once. We have had to invent new efficiencies, modify our schedules and lives and remove things that simply don’t fit. There is little margin for error, no out clause when you have a busy day or didn’t have the foresight to pack food, just don’t feel like cooking, or have been taking down by a ruthless flu. Days like these, it is really good to have a sister-wife. It gets easier with every month, and as the air gets sweeter with the scents of spring the ground warms and promises much goodness to come. My skin looks great, my body feels awesome and I now do dishes as a form of meditation. It’s hard to believe that we’re almost a quarter of a way into this year. I am humbled and moved by people who tell me that this quasi-insane undertaking has made them look at their own dinner plates and think about where their food comes from. We are encouraged by all of our blog readers and Facebook followers who are learning and laughing with us. In the next episode of “It might be totally gross,” I am going to attempt to learn how to bake (without using baking powder) with our monthly shares of freshly milled wheat & rye flour from the Mendocino Grain Project – after being gluten-free for over four years. When there is flour, you learn to bake bread. This is how it works; food determines life now. Meals are created with what is available, in the time we have. Our plates reflect our landscape and every single thing we eat can be traced back to the hands that grew it, raised it or picked it. The feeling I had in the Band-Aid aisle really had less to do with all the options, but of the alienation that we experience as normal part of everyday life. Nearly unlimited options are presented to us in the Band-Aid or cereal aisles, making us feel like we are choosing. Yet, somehow we usually end up feeling somewhat defeated by trying to find what we really want in a box. Because maybe what we’re looking for isn’t merely, but connection. This year is fundamentally about reconnecting. As we connect the dots in the local food system, we are building profound new relationships with the place we live and love and the people who are stubborn enough to farm here. We have redefined choice; by embracing limits we have opened ourselves up to an existence that is more deeply satisfying and delicious than I could have imagined. 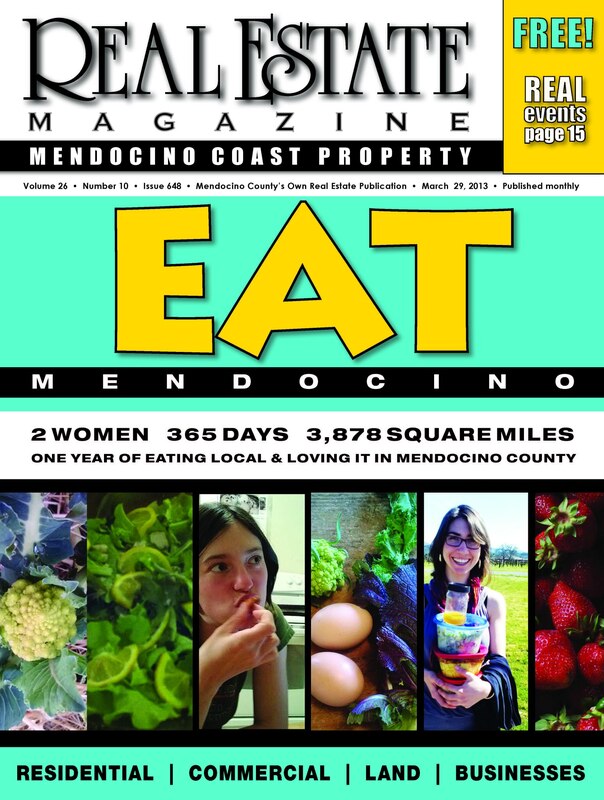 Categories: Media, Musings, Uncategorized | Tags: county, eat local, farm to table, locavore, mendocino, real estate magazine, westside renaissance market | Permalink.